-- Select a Size/Color -- 3/4" Width 1" Width - Out of Stock! Bring attention to your dogs need and behaviors with the Bark Notes Dog Collar and Leash Attachments Adopt Me! Tell other what your dog needs or need to alert you about with the Bark Notes Dog Collar and Leash Attachments by Canine Friendly! These bold prints on a bright backer is easy to read even from a distance. 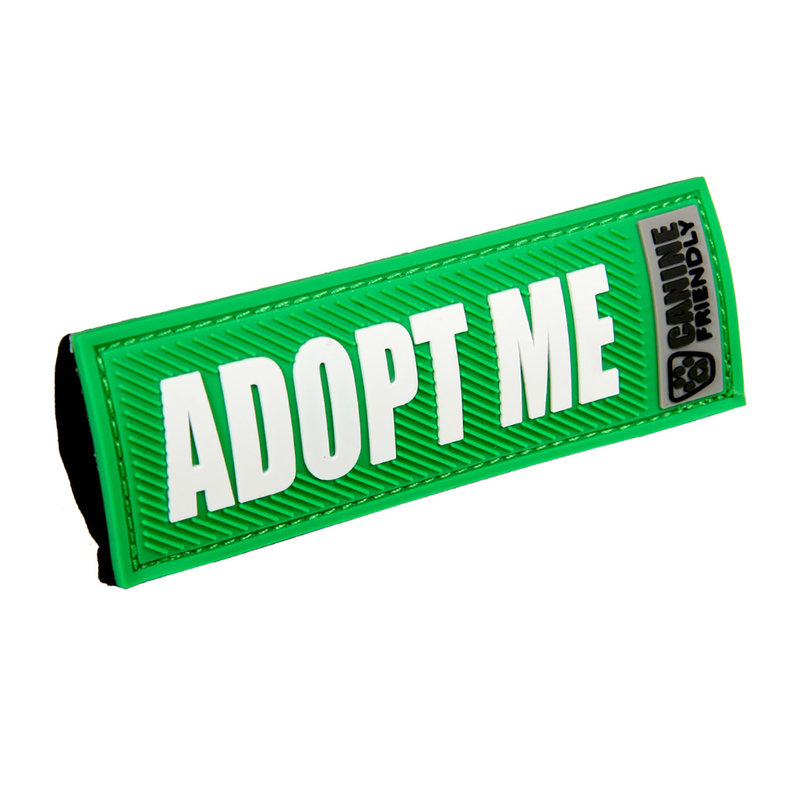 Made of a soft, flexable PVC label with a stretchy neoprene backing allows the product to move easily oer the collar or leash. Great for training humans on your dog without having to say a word. Posted On 09/22/18 by J from , AR Yes, J recommends this product! We used these on the leashes of dogs we brought from our local shelter to a retail store in hopes of giving them a better chance to be seen/ adopted. These helped shoppers/ visitors to realize the dogs were available for adoption and not our personal pets. It would be better if these were printed on both sides as there were times when the "adopt me" side was not showing. That may not be an issue if the attachment is used on a collar instead of a leash. Highly recommend for use with foster dogs and shelter dogs when being walked in public or attending events. Posted On 11/15/17 by Erin S from Frederick, MD Yes, Erin S recommends this product! Bought this to donate to my local shelter for adoption events. Seems well made, though I wish the wording was on both sides. Posted On 08/31/16 by Heather M from , MN Yes, Heather M recommends this product! This is perfect to put on the leash of our foster dogs when we go to an event! Bright and noticeable. I love the variety of products tailored to my pet's needs.